Celebrating Dia de Los Muertos this year? It’s just like Halloween only it lasts all the way through November 1st! There’s twice as much time to party and dance the days away. You just need to make sure you have the right look to celebrate this Mexican holiday. Check out this Women’s Day of the Dead Half Mask, it will be perfect! Take a look through our collection of sugar skull costume and find the one that suits you best. 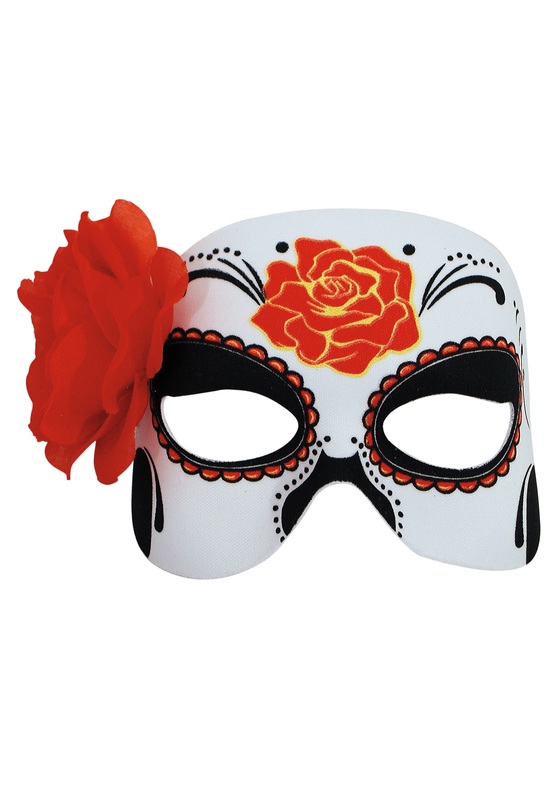 Then once you add this lovely half mask you’ll be ready for a few nights of celebrating the dead! This mask has a lovely rose design right in the center of the forehead as well as an attached rose to the right side. It will add the perfect touch of mystery to your outfit and will entice everyone to join you out on the dance floor. If you want to kick things up a notch you can check out our makeup kits and give the rest of your face a ghoulish makeover as well! Enjoy your Day of the Dead when you do it right with the amazing half mask. The photo online looks great but when I received it and saw it in person, it's horrible. The paint is cracky and white shows through. It's like someone painted a cardboard disposable plate. It's not cut symmetrical at all. One cheek is larger than the other and the eye holes are not lined up. The nose is cut crooked at well. Severely disappointed! HOWEVER, when I called customer service they were very understanding and offered me a refund or to be sent another mask that would be first checked over for quality before it was sent. They promptly responded to my complaint and offered solutions.